Basil and the Big Cheese Cook-Off 1 SAY CHEESE! SURELY EVERY MOUSE THE WORLD over has heard of the International Cheese Cook-Off! Held every year in Paris, it brings together the finest mouse chefs and most discerning lovers of cheese dishes from every corner of the globe. And of course, every mouse has heard of Basil of Baker Street, the world-famous detective and my dear friend. 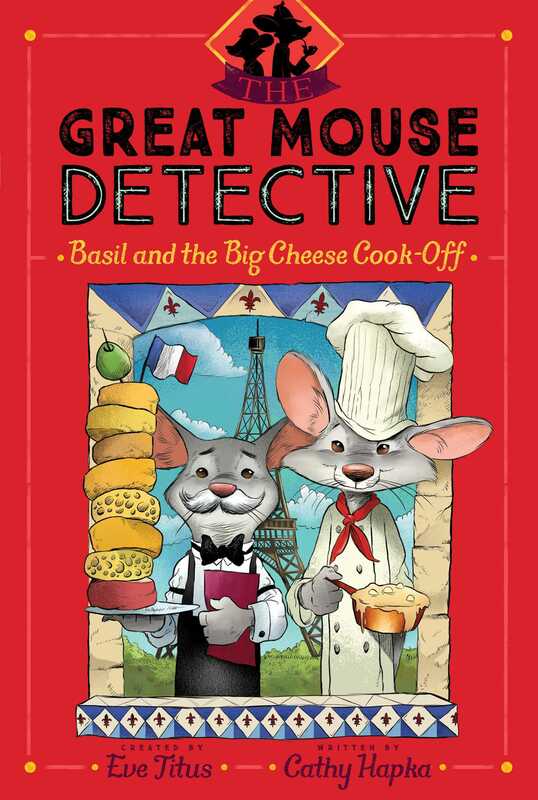 Basil has solved so many tricky cases that his fame, too, has reached every nook and cranny of the mouse world. But allow me to tell you about it from the beginning. . . . It was the year 1895. Basil and I were at 221B Baker Street, our home as well as that of the world’s greatest human detective, Mr. Sherlock Holmes. We were hidden away in a corner of the great man’s study. That was where Basil had learned many methods of scientific sleuthing, methods that had served him very well over the years. But he, like Holmes himself, was always eager to learn still more, and so we often sneaked upstairs to eavesdrop. On that particular evening Basil was listening intently, scribbling notes in shortpaw as the brilliant detective discussed coded messages and handwriting analysis with his dear friend Dr. John H. Watson. I, however, had quite a different focus. While I had joined Basil on many of his most famous cases, I was at heart still a medical mouse—Dr. David Q. Dawson, at your service—and easily distracted from the in-depth details of detecting. And that night there was plenty to distract me, for Holmes’s housekeeper had set out a platter of fruits and cheeses for the men, and the odor drifting toward us was heavenly. I stayed quiet after that. But later, as the two of us made our way down to the cellar, where our mouse town of Holmestead was located, my mind was still locked on the topic of cheese. “Let’s stop at the cheese shop for a nibble,” I suggested. But halfway to the Holmestead Cheese Emporium, we spied a harried-looking mouse racing toward us. It was a youngster known as Nigel who often stood sentry at the edge of the village. Nigel handed over a note. Basil unfolded it, and I peered over his shoulder, curious. The message was written in a tiny, precise hand, covering the entire sheet of paper, but though my eyesight is good, I could read scarcely a word of it. As Nigel wandered off, Basil gave his full attention to the note. I waited patiently for him to translate it for me, knowing him to be fluent in French as well as several other languages. However, he simply refolded the missive and tucked it away in his cape without a word. With that, he turned and strode off toward home. I clenched my paws, tempted to refuse Basil’s orders for once. But even in my fit of temper, my curiosity was piqued, and I knew come morning I would go along with him as usual. . . .
Sure enough, the very next day I found myself scurrying through the streets of London before dawn. The city was quiet, though we knew it was an hour of creeping paws and twitching whiskers and thus kept a careful lookout for cats. Fortunately, we didn’t encounter a single feline and soon hitched a lucky ride on a milkman’s cart. In that way we safely reached Victoria Station. And that, at last, was when I heard the first details of the Case of the Big Cheese Cook-Off.